Some years ago I held a graduate seminar where the participants were to write their master’s theses applying the continuum approach. These studies are in Finnish, but some other things are already available in an international language. 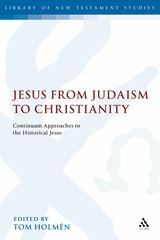 – Jesus from Judaism to Christianity: Continuum Perspectives to the Historical Jesus (ed. Tom Holmén; London: T&T Clark International, 2007), xi + 179 pages. – Jesus in Continuum (ed. Tom Holmén; WUNT, Reihe A; Tübingen: Mohr, 2012), xxvi + 492 pages. – “An Introduction to the Continuum Approach”, Jesus from Judaism to Christianity, pp. 1-16. – “Jesus in Continuum from Early Judaism to Early Christianity: Practical-Methodological Reflections on a Missed Perspective”, Jesus Research: New Methodologies and Perceptions — The Second Princeton-Prague Symposium on Jesus Research, Princeton 2007 (eds. J. Charlesworth & P. Pokorny; Grand Rapids: Eerdmans, 2014), pp. 201-212. – “A New Introduction to the Continuum Approach”, Jesus in Continuum, pp. IX-XXI. – “Hermeneutics of Dissimilarity in the Early Judaism – Jesus – Early Christianity Continuum”, in: Jesus in Continuum, pp. 1-42. – “Caught in the Act: Jesus Starts the New Temple – A Continuum Study of Jesus as the Founder of the Ecclesia”, The Identity of Jesus: Nordic Voices (eds. S. Byrskog, T. Holmén & M. Kankaanniemi; WUNT, Reihe B; Tübingen: Mohr, 2014), pp. 181-231.